2014 Ford Escape 4WD Titanium Offered by Chardon Motors. This is a CARFAX CERTIFIED vehicle. Super clean in and out! 2.0L Ecoboost/4WD/Leather/Remote Start** Drives prefect with all the modern desires. We have done for you 4 new tires, brakes service along with oil change and more! Front bumper had a crack in it from the previous owner. No accidents just a cracked bumper. We put a new one on! Looks perfect. This premium TITANIUM Escape has very desirable options and is priced below market. Thousands less in fact, below comparable Escapes. We only offer the NICE ones here. Premium 18" alloy wheels, backup camera, microsoft sync, dual auto climate, full power accessories, power tailgate with no hand opening feature (you swing your foot! ), and much more. This price range for this new will make a fantastic payment on a loan. Stop in today and drive this sweet Escape! .....Ready to go. 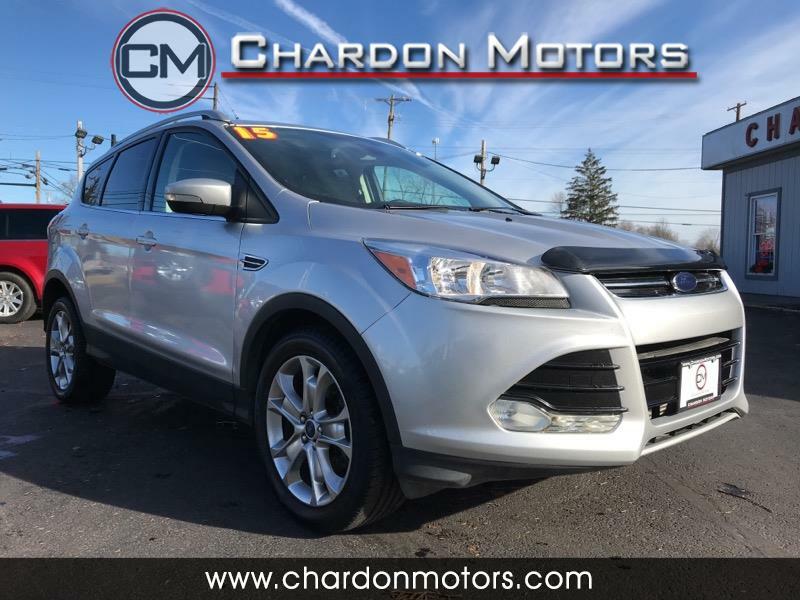 Visit Chardon Motors online at www.chardonmotors.com to see more pictures of this vehicle or call us at 440-285-2699 today to schedule your test drive. Chardon Motors is an honest family owned business with over 25 years of supplying above average quality vehicles to our valued customers/friends at very fair prices. We have Carfax reports on hand for each vehicle. It is our mission to find a better vehicle for you than you expect. Information in our ads are as accurate as possible, but we are human and we can make mistakes. Please call with any questions. Bank/CU financing available for most buyers. Super low financing rates available through multiple sources. Any information we collect from you is kept strictly confidential. Secure online credit application. Off hour appointments can be arranged. Flying in? We will pick you up at Cleveland or Akron Airports (CLE or CAK). Give us a call and let us impress you. Contacts are Phil or Jeff. 440-285-2699. Out of town? Call toll free 800-777-9213. Message: Thought you might be interested in this 2014 Ford Escape. Coverage includes major engine components, as well as transmission components, differential components on 4wd vehicles, rental car, and towing if applicable. See dealer for complete warranty coverage information. Other warranties available up to 48 Months and unlimited miles for an additional charge.